So you want to form a Captive… Now what? I Want To Form a Captive. Should I Choose a Single Parent or a Sponsored Cell? A single parent captive insures the risks of related companies and is owned and controlled by the related company or its affiliates. This is the most common form of captive, which can be organized under the laws of most any jurisdiction with a captive insurance statute. Single parent captives are a closely held insurance company whose insurance business is primarily supplied by and controlled by its owners, and in which the original insureds are the principle beneficiaries. The insureds have direct involvement and influence over the captive’s major operations including underwriting, claims and investments. This type of captive is typically established and capitalized by a third party (could be captive managers, consultants, insurers and investors). The third party or sponsor charges a fee (rent) for providing a facility that allows insured to participate in their own insurance risk and garner the financial benefits of a single parent captive at a lower operating cost. Segregated Cell or Protected Cell Captive enable users to legally segregate their assets and liabilities within a separate vehicle, or cell. This allows many cells to be created within the same captive. These structures have been popular in foreign domiciles since around the year 2000. Incorporated Cell Captives are a natural evolution of the segregated cell concept that not only provide legal separation between participants but also allow the individual cell to be treated under corporate law as a single corporation making it more like a true single parent captive. 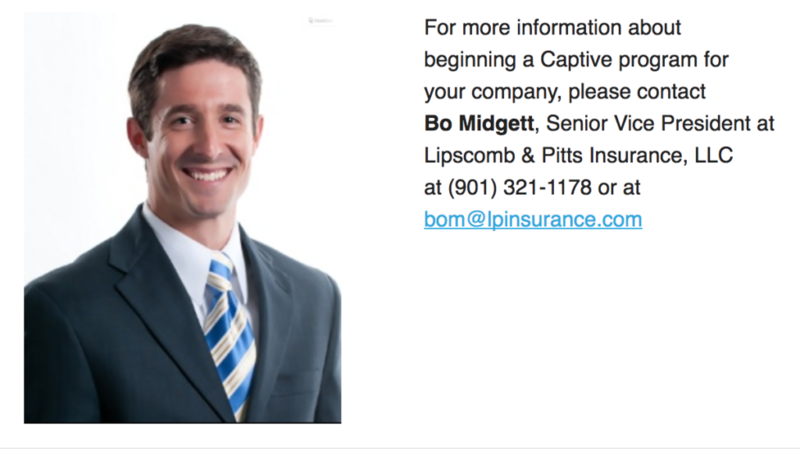 Series LLC Captives exist in domiciles that will allow a limited liability company to be licensed as an insurer and that insurer is then able to establish independent series or “Series Business Units” (SBU) to legally separate participants. Much like the incorporated cell captives, Series LLC captives allow the individual SBU to be treated as a separate corporation for both corporate law and tax purposes. The Series LLC concept has been the focus of many of the fastest growing US domiciles in recent years. Now that we have the definitions established, we must then look into some differences in structure and cost. 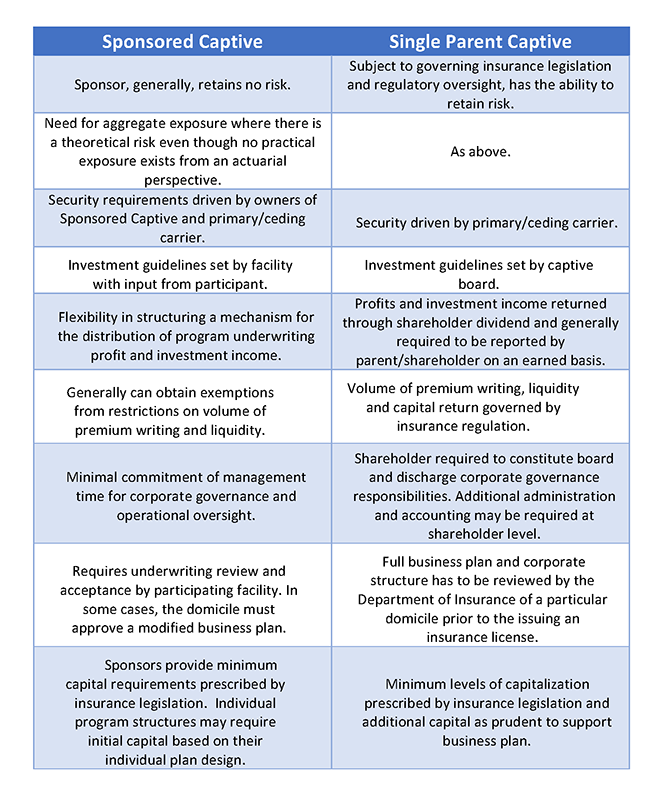 When considering the operating costs of a captive vehicle, the prospective business must evaluate not only the fixed cost of external resources to establish and run the facility (hiring vendors in the legal, tax, accounting, actuarial and insurance management professions) but also the opportunity cost of dedicating internal resources to govern and manage this insurance entity. By purchasing vendor services “in bulk” across a larger enterprise as well as centralizing and standardizing the day-to-day operations of all of the “cells” or “SBUs” within the captive facility, a Sponsored Captive typically can establish and operate individual programs within a “cell” or “SBU” at an appreciably lower cost to forming and managing a Single Parent Captive. This is a key point of discussion when deciding between the two forms. The other area to consider, however, is that when we are purchasing vendor services “in bulk,” we may not have the control that we would have if we were purchasing them on a direct basis. If we are unhappy with the service that we are receiving from one of our vendors, for instance, we may not have the freedom to terminate our relationship with that vendor as we would in a single parent relationship. In deciding whether to form a Single Parent Captive or establish a separate “cell” or “SBU” in a Sponsored Captive, an insured should carefully consider the advantages and disadvantages of each alternative. Many times the decision can be influenced by an understanding of both financial and non-financial terms proposed for the insured to achieve their risk management as well as operational objectives. A prospective risk-taker must weigh the lower operating costs and limited flexibility of working within an established Sponsored Captive to create, implement and operate a “cell” or “SBU” against the higher operating cost and total control in being the sole shareholder of a Single Parent Captive.